I know, I’ve disappeared again for a month or so. Sometimes these things happen. Anyway Happy Hallowe’en everyone. 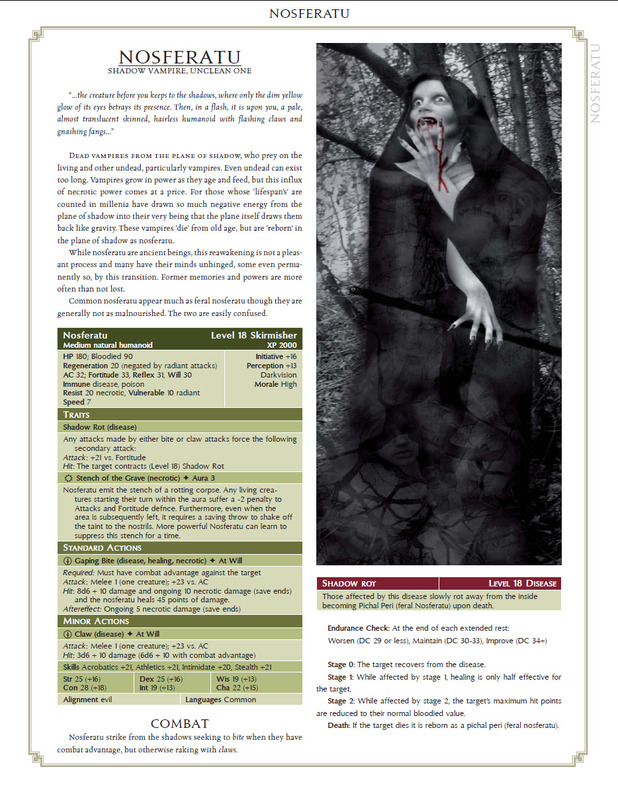 Of course it would be nice to have a new Vampire Bestiary pdf ready for Hallowe’en – but we all know I’m currently about as organised as a tramp’s closet so that hasn’t happened. Brief Updates: The perennial problem with the maps will be sorted within about a week or two. I’m getting this really simple program that can create maps (and more besides). So with that I can create (colour and 2.5D) maps within about 30 minutes (once I familiarise myself with the program which shouldn’t take more than a day). Basically I should be able to do all the maps for Mountain of the Cannibal God, Temple of Death and Castle Dracula within a week. Once I get some working maps ready I’ll post them here so you can see. TEMPLE OF DEATH is about 10 pages from completion…although at my current rate that may still take a while. The artist Peter Szmer has just turned in the cover for Vampire Bestiary Part Three CASTLE DRACULA. Unfortunately I’m still waiting for money to clear (as with the above map program) so I can’t show it to you yet (for a day or two). But its pretty tasty. Okay so what do I want to talk about today. Well, as the title suggested the Nosferatu. What are the Nosferatu you might ask. Well the term Nosferatu probably stems from the Romanian word “Necuratu” (‘Unclean Spirit’) or the Greek word “Nosophorus” (‘Disease Bearing’) but was popularized in 1922 with the release of the film Nosferatu (aka Nosferatu: A Symphony of Horror) which was an (illegal due to copyright infringement) retelling of the Dracula story by Bram Stoker. In this film the character of Count Dracula was replaced by that of Count Orlok and the term vampire is replaced by nosferatu. Over the years the term has become synonymous with vampires, but there is usually no distinction between vampire and nosferatu…until now. While my initial thoughts were of a simply more powerful vampire (which doesn’t really work taking into account vampire hieararchy/longevity) I tried to re-envision the nosferatu as, not so much a type of progenitor vampire, but more in terms of a far more ancient and powerful PLANAR race. They look older (compare Orlok to Twilight vampires for instance). 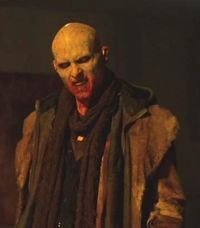 Jared Nomak: From Blade II…it is my contention that the Reapers are/were Damaskinos’ attempt to genetically mutate vampires into nosferatu. Its also notable that Damaskinos’ own appearance seems to be withering into a form similar to that of the classic nosferatu. I’ve been thinking that at some point a vampire might ‘die’ from old age only to awaken on the Shadowfell as one of the nosferatu. Santaniko Pandemonium: From the Rodriguez/Tarantino movie From Dusk Til Dawn. If you can think of any others let me know. So Nosferatu are, in a sense, dead vampires from the Shadowfell. This also ties in with the idea that they prey on other vampires (Blade II Reapers). In addition it ties with my own idea of having the Daemons as spirits from the Shadowfell (and led by the Four Horsemen) because the Shadowfell would be a place of disease (tying into the Diseased Eight and Oinodaemons). So the Daemons would be the spirits while the Nosferatu would in a sense be the corpses. The appearance of the nosferatu ties in with bats and made me think that they would, to a degree venerate the Aztec Bat God Camazotz. This ties us in nicely with the Salma Hayek character Santanico Pandemonium in From Dusk Til Dawn, which has the bar set atop a buried Aztec Ziggurat. Disease: Disease Bearing and Unclean. For 3rd Edition, my plan for the Nosferatu was to make them the Vampire equivalent of the Demilich. So as lich is to demilich so vampire is to nosferatu. For 4th Edition I planned to have the Nosferatu show up in Vampire Bestiary 5 (if I ever got around to it) or some sort of Epic Shadowfell based Bestiary. For that I created a vague hierarchy which sort of parallels that of Vampires but is a full tier higher (high Paragon Tier – mid-Epic Tier). This drew upon a handful of different vampire monsters and nomenclature to create the following. Size and Type: Type changes to undead (if not already). Size is unchanged. Hit Dice: Increase all Hit Dice to d20’s. Armour Class: Natural Armour Bonus +30 (Ex), Deflection Bonus = Charisma Modifier (Su). Attack: Retains all the attacks of the base creature but gains a Claw attack. Create Spawn (Su): Those killed by the diseased bite of a Nosferatu return as half-strength Nosferatu (known as Pichal-Peri) under the command of their killer. Fast Healing (Ex): The nosferatu heals 25 points of damage per round. Immunity: The nosferatu is immune to cold and electricity. Shadow Form: The nosferatu can choose to exist as a shadow. Shapechange (Su): As per the spell. Abilities: Increase from the base creature as follows: Str +30 (note this includes two virtual size categories), Dex +20, Int +10, Wis +10, Cha +20. Skills: Nosferatu gain a +40 racial bonus to Bluff, Hide, Listen, Move Silently, Search, Sense Motive and Spot checks. Otherwise the same as the base creature. Okay, still a few kinks to be ironed out in the above template…any suggestions for feats/divine abilites would be helpful. The following is the current (early) build of the 4th Edition Nosferatu. Its still not exactly what I am aiming for, but its sort of the mid-point Nosferatu between the Feral (weak) – ‘basic’ (ie. this one) and the Shrouded (magic)/Shadow Knight (martial) split. The latter being those with their memories returned/intact. The art used was by artist-photographer-model Geneva Rosett-Hafter whom I hired to do the Chapter Title illustrations based on various vampires (this was back in the VERY early days when the book contained Vampires, Nosferatu, Varcolac’s and Disir among other chapters). The above was Count Orlok. At some point I’ll probably show her other stuff like Garm and Alabaster. 😉 Its all very cool, although it didn’t really fit in when I hired Peter Szmer to do the art and the multi-chapter idea got messed up and abandoned in favour of the multi-pdf approach. Looks interesting, eager to see the 4e version. Why the return to 3.5E by the way? I am getting ready to start a new campaign that will be a mixing of 4e and Next with some of our class ideas thrown in and one of my PCs wants to play a vampire. I am currently brainstorming how to make that work, so anything you’ve got on the subject I’m eager to review. Hi there Dave, while I have the 4E Nosferatu entries ALL basically finished (and just to clarify I won’t be showing them all here…maybe 1 or 2), I forgot I have them designed in an old layout style, so I am basically having to copy and paste for every single ‘box’ into the new style. A few people at ENWorld have been asking for the 3.5 Nosferatu for a few years now and I just decided I’d have a crack at it, even though the 3.5 Nosferatu was originally intended as simply a (vanilla) “Super-Vampire”, whereas the 4E Nosferatu was developed into a specific race with multiple ‘castes’, leaders, a religion and so on and so forth. What level is your new campaign starting at? Would your PC be willing to play a Dhampir (Daywalker) instead of a Vampire? We are stating our at level 0! I am letting them choose a race and background (from Next) and then we start playing. Level 1 the choose class or specialty (not sure which – could be both). They really like 4e powers, but they also really enjoyed a couple of side adventures that I did completely freeform (PC wants to do X, DM [me] says Y is your DC and your damage or effect is Z). So I am trying to combine the two. I am think of letting them free form, but give them (and myself) a chart like you created for the wizard and fighter so they can gage the general effect of their choices. I would also create some specific powers or spells based off the chart for when they just want to pick a power and go. The vampire (I’ve decided vampirism only afflicts humans) PC would probably be willing to play a Dhampir if I brought it up, but I am personally interested in exploring simply vampire race. I think it fits well into the level structure of D&D. The older vampire is more powerful thing. I think it may be a hybrid class type thing (I told the PC he could still choose a class), were they can pick class or race powers at various levels. I also need to balance the cost and benefits of being a vampire. I am think of having a lot of negatives at first that lessen or go away as the PC gets more powerful. Hey Edward, its been a while for me and 3.5E so I hit a number of stumbling blocks in the design. Hopefully get those sorted as soon as possible. unfortunately in my experience its nothing like riding a bike, you forget the rules, feats, spell-like abilities and skills. But I have a completely free day tomorrow with no distractions so I’ll try and sort something out. hope the campaign goes well. I suppose with the vampire its about checks and balances. I think you have two options. 1. Make it so that he has the full vampire powers from the beginning, but also make a case of playing up his weaknesses in both combat AND roleplaying situations. I’ll post up my basic vampire from Castle Dracula tomorrow…I think I previously posted an earlier incarnation of it on this website, but I have probably changed things a bit. 2. Develop it so that he’s infected but somehow he doesn’t yet have the full range of powers OR weaknesses yet. This way he can go out in the daylight, but his eyes hate bright light, he grows pale and his general condition worsens. I think this could be an interesting page for inclusion in Castle Dracula itself. 3. Vampirism is like in infection, but the PC will start out with only a few of the vampire powers and the worst of the weaknesses. As they increase in level the weakness lessen or go away, and they can gain more vampire powers. The vampire starts out with great strength, speed, healing, but is also extremely vulnerable to radiant damage & sunlight, holy symbols and turning, can’t cross running water, aversion to garlic (maybe), etc. As they get more powerful the PC can shapechange to a wolf (bat maybe), gain gasseous form, charm powers,etc. – if they chooses those over class powers. They also become less vulnerable to radiant damage and less affected by water, garlic, holy symbols, turning, etc. over time. Thus, at low level they have some overpowered abilities, but some harsh weaknesses to balance it out. But as the PCs level up the vampire becomes more powerful, just like the rest of the party. I also gave them +10 str, +5 dex & x2 speed at night or underground, and they take 1hp damage/rd while in direct sunlight. Durinng the day they loose their str, dex, & speed abilities and cannot use their vampire powers. Just to let you know I updated the entry with the 4th Edition Nosferatu (current build). I’ll return my attention to the 3.5E Template tomorrow. The basic Nosferatu is roughly equivalent (in raw power) to a Vampire Noble. So they sort of devolve (a bit) from ancient elder vampires into this form. sorry about that. I’ve had to work the past few nights (and again tonight). I haven’t forgotten, but it may actually be a few days before I can update. I’ll try and update on Friday but it may be Sunday/Monday (I also have to work Saturday night to cover a friend’s shift). Spider-related abilities of a sort might not be a bad idea. Like shadowy webs that can be used as makeshift lacerating traps for their lairs. I always kinda saw vampires as being mored like spiders. Perhaps integrated Scout (urban variant from WOTC) levels? Perhaps some sort of ability to cast a reflection in a mirror…but have the reflection attack as if it were a duplicate of itself? …or perhaps some sort of ability to have it’s shadow function as a duplicate of itself…but still be a shadow? Perhaps some sort of ability to turn blood into a weapon? I added a little more last night but I had to work last night as well (or rather was offered to get a day off next week). Unfortunately I am suffering with a cold (probably caught it on Thursday night – been feeling a bit weak since Saturday afternoon) but that won’t slow me much, not so as you’d notice anyway, I hope…that said I have about two dozen questions pending on the forums (and a few via emails) and I am not sure my heads ready for everything tonight with this cold. 1. The 3E Nosferatu was meant to be a catch-all version of the monster, much like the atypical Vampire. 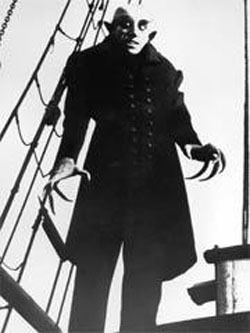 The idea of different types of Nosferatu is something of a 4E-ism. Not that there is anything to say we couldn’t have variants of the 3E Nosferatu of course. I keep making the mistake of thinking that the 3E Nosferatu shouldn’t be SUPER-powerful (as it was originally intended). 2. Your spider idea is interesting because I was thinking that there could be a snake-based version that would explain the Pandemonico (sp?) 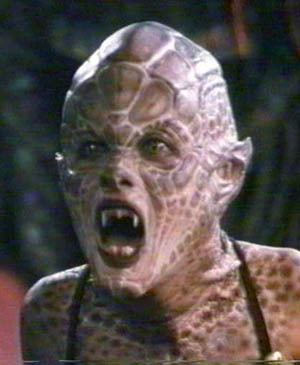 character in From Dusk Til’ Dawn. Just did a google search for Spider God and it appears they recently uncovered a Temple of a Spider God in Peru. 3. The caste system (I created for the 4E Nosferatu) was a split along martial and magical paths: Assassin-Knights and Priest-Wizards. 4. As regards abilities. I was definitely thinking of Shadow Self (based on the original Nosferatu movie’s classic scene of the shadow walking up the stairs). I do like the idea to turn blood into a weapon. Diseased [Effect] seems obvious (maybe too obvious). Improved & Uncanny Dodge…maybe. Perfect Initiative…possibly. Nosodic (diseases become positive effects). I know, I know. Its easy to get stuck in a rut on design issues. Happens to me all the time. I still think the 3E Nosferatu needs some work. But I am not totally sure what should be incorporated at this stage. I think its mainly a philosophical problem. The 4E Nosferatu has multiple versions so each version doesn’t need to carry all the ideas. Whereas the 3E Nosferatu is meant to be the definitive version AND Demigod-Lesser God level as well. 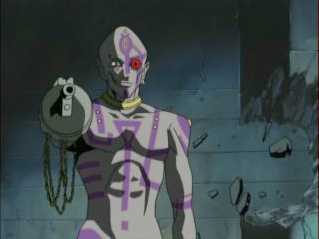 So the 3E version needs to be more like Incognito from Hellsing and less like every other inspiration. o_o I don’t remember much about Hellsing. I am kinda curious about what vampires might originate from though. A progenitor vampire of sorts. well I am sure you can check out numerous clips of Hellsing on youtube. You probably want to check out Alucard’s (ie. Dracula’s) fights with Anderson (Roman Catholic Paladin) and his fight with Incognito (Ancient Vampire and possible Avatar of Set). Actually working on Castle Dracula today and finished the section on Vampire Gods (and another section on the Vampire Universe (that’s not a specific place, but rather just a look at all the vampire races across the universe). So I think I have the origins of the Vampires covered with those two articles in the book. Looking at the above, Creeping Fear (coupled with Shadow Form? ); Gaze of Terror and Howling look very interesting. Blood Vomit might also be cool as Death Throes. I’m honestly struggling with this. I no longer understand the role of the 3E Nosferatu (and that in turn is having an impact on where the mechanical design goes). Given that it is meant to fill the same power niche as a Demigod, on a philosophical level, where does it even dwell? The 4E version makes sense to me. They are basically the second death of vampires. Undead who fade from the prime material and (re)awaken on the shadowfell. Which brings up the idea that moving away from the shadowfell would be the equivalent of a vampire not feeding. The nosferatu encountered on the prime material would have to drain vampires (and other undead) to sustain itself, rather than prey on the living, which it might do out of basic instinct. Creeping Fear (Aura 20 ft…or variable depending upon illumination; DM’s decision): The nosferatu’s shadow has a life of its own and can attack and strangle a single target (for negative energy damage and a two level drain) each round. Gaze of Terror: All living targets within 20 ft. must make a Fortitude saving throw or be frightened to death (suffering a heart attack). Those making a successful save have their current hit points and strength halved (until the end of the encounter). 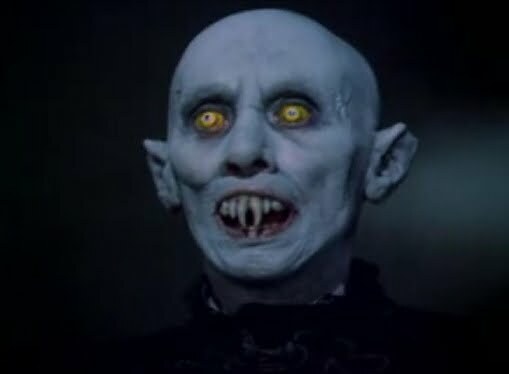 I always saw Nosferatu as just really, really, really old vampires progenitors or vampires that originated from the lower planes. The progenitor monster seems best served by augmenting the existing vampire rather than creating a wholly new race/type. As regards the vampires of the lower planes angle, it sort of assumes a society, which sits at odds with the idea that they would be Demigods/Lesser Gods in power. Edit…Actually give me another day or two on that. This 3.5E stuff is still brain-melting me (its like a foreign language at this juncture), but obviously we need to update the feats into Divine Abilities or the equivalent. – Combat Reflexes: …make 2 claw attacks as attacks of opportunity? – Dodge: Double your dexterity bonus against a single target. – Improved Initiative: Something like the Pathfinder Mythic rules power might be a good fit here. Wherein you get a +20 Intiative bonus or can take an extra action (round?). Or we could use my Perfect Initiative divine power. – Lightning Reflexes: a flat bonus is too boring. Maybe a divine ability that allows it to always succeed at Reflex saves if it wins initiative…? I don’t think it was, sorry. I am sure I would have posted it here. Any forthcoming RPG stuff from me is currently on indefinite hiatus. Hey Lord Arbuckle, I am sure more free content would make a lot of people happy but I am trying to prioritise my time at the moment and any 3.5E stuff simply isn’t on the agenda. So I don’t want to be giving people false hopes. I’m doing something else at the moment and if that doesn’t work out I’ll come back to RPGs and finish the Vampire Bestiary Vols. 2 & 3 (for 4E) and the Pathfinder versions.